A mock-up of the Mitsubishi X-2 experimental technology demonstrator. Image courtesy of Hunini. Power for the X-2 demonstrator comes from two XF5-1 turbofan engines. Image courtesy of Hunini. The X-2 experimental aircraft features a longer nose section. Image courtesy of Hunini. Maximum take-off weight of the X-2 is 13,000kg. Image courtesy of Hunini. Mitsubishi X-2 Shinshin, also known as ATD-X (Advanced Technology Demonstrator-X), is a stealth experimental technology demonstrator and research prototype designed to demonstrate technologies required for Japanese indigenous fifth-generation fighter aircraft, designated F-3. The multimillion dollar demonstrator project is being developed by Mitsubishi Heavy Industries (MHI) in co-operation with the Japanese Ministry of Defence’s Technical Research and Development Institute (TRDI), for the Japan Air Self-Defence Force (JASDF). The first prototype was unveiled in January 2016 and its maiden flight is scheduled for February 2016. A mock-up of X-2 demonstrator was built for testing and evolution of stealth characteristics in France in 2005. First flight of a metal wind-tunnel model was made to test flight control systems, sensors and performance characteristics in 2006. The ATD-X experimental programme received approval for the next phase of development in 2007 and the demonstrator was rolled out in 2014. 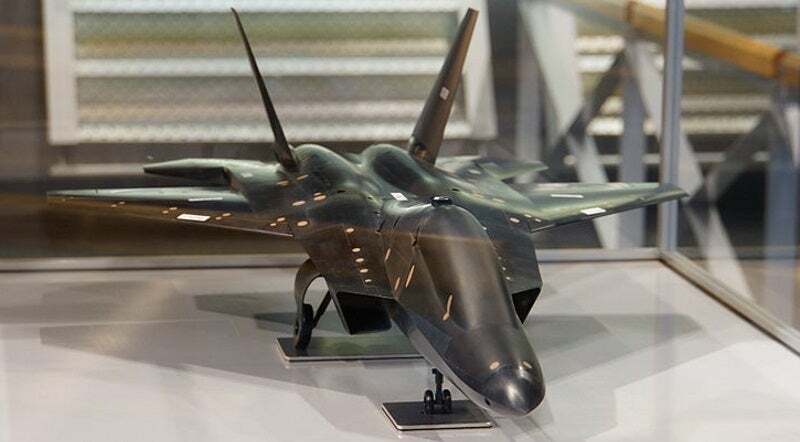 Intended to replace Japan’s ageing fleet of fighter aircraft, the F-3 stealth jet is expected to enter serial production in 2027. The twin-engine, fixed-wing ATD-X demonstrator aircraft features aerodynamic design with longer nose section. It has a length of 14.17m, a wing span of approximately 9.1m, and a height of 4.51m. Its maximum take-off and empty weights are 13,000kg and 8,900kg respectively. The cropped delta wings with cutting-edge root extension allow the aircraft to fly safely in a high angle of attack condition. Two outward canted vertical stabilisers on the trailing edges improve aerodynamics and stealth characteristics. The long and flat fuselage is blended into the wings. The Shinshin is operated by a single pilot and is fitted with a retractable tricycle-type landing gear arrangement with one nose wheel and two central main gears. It also features aerodynamic control surfaces. Two rectangular intakes are provided on either side of the cockpit, while the S-duct design further improves aerodynamic efficiency of the aircraft. The Mitsubishi X-2 demonstrator has a single-seat cockpit, enclosed by a transparent canopy. Onboard avionics include active electronically scanned array (AESA) radar, advanced electronic countermeasures (ECM) and electronic warfare support measures (ESM). "The first prototype was unveiled in January 2016 and its maiden flight is scheduled for February 2016." A fly-by-fibre optics flight control system facilitates efficient data transfer between the cockpit and the aircraft’s control surfaces, through an electronic interface. The onboard self-repairing flight control system provides the aircraft with automatic detection of failures in the flight control system. The experimental aircraft will be powered by two XF5-1 low-bypass turbofan engines, developed by Ishikawajima-Harima Heavy Industries (IHI). With a length of 3m and a diameter of 0.6m, each engine produces a thrust of up to 11,000lb. The engines exhaust through low-signature exhaust ports in the tail of the aircraft. The engines are controlled by full authority digital electronics control (FADEC) system, and are equipped with one high-pressure turbine, one low-pressure turbine and three-dimensional thrust vector control technology. The engine’s overall pressure ratio is 26:1 and the thrust-to-weight ratio is 7:8:1. The aircraft will employ afterburners for increased thrust. The Mitsubishi X-2 Shinshin can fly at a maximum speed of Mach 2.25 and a supercruise speed of Mach 1.82. It can operate over a range of 2,900km with two external fuel tanks and has a ferry range of approximately 3,200km. Service ceiling of the aircraft is 65,000ft and the estimated combat radius is 761km.